The main idea of Montessori Method is that every child is treated with respect, given freedom within the limits of a carefully structured environment, and allowed to develop naturally at their own pace. In 1907 Maria Montessori opened her first school, Casa die Bambini, in a slum area of Rome. St. Nicholas Montessori Teachers Association started on May 10th 1970. What makes it different from other types of pre-school? In Montessori schools the children follow a set programme of tasks or exercises. They learn everyday life skills such as dressing themselves, washing themselves etc. They learn social graces and manners but also cover a wide range of subjects including Mathematics, Reading and Writing, History and Geography, Science, Biology, Music, Irish, Art, Drama and Literature. Subjects may vary slightly, however small class numbers, individual attention, practical life skills and a commitment to the development of each child as an individual, do not. 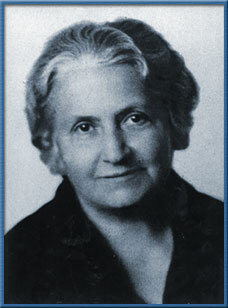 Maria Montessori(b.1870 d.1952) was born in Italy and trained as a doctor. She was the first woman doctor of her day. She went on to lecture at university, then studied philosophy and psychology, became an educationalist and devoted her life to working on behalf of the child. Dr. Montessori's main objective was to help children everywhere to reach their maximum learning potential, while becoming well balanced individuals able to cope with the pressures of modern day living. Montessori education provides a range of experiences which will stimulate a child's love of learning and discovery.